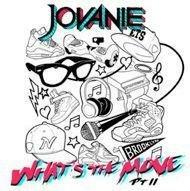 Jovanie Finally Drops "WHAT'S THE MOVE PT. II"
NEW YORK, NY--(Marketwired - Oct 30, 2015) - Atlantic Records has announced today's release of the much anticipated major label debut from Brooklyn-based R&B singer Jovanie. "WHAT'S THE MOVE PT. II" is available now at all DSP's http://smarturl.it/DownloadWTMPt2. "WHAT'S THE MOVE PT. II" sees Jovanie teaming with a number of today's most creative producers, including The Featherstones (Trey Songz, Ty Dolla $ign, Wiz Khalifa), Squat, Daniel Majic, DTB, and Phat Boiz (Sean Kingston, Tyga). The project has been heralded by an electrifying string of singles, including "Whip!," "Ooh Girl," and "What's The Move," the latter track hailed by The FADER for "giving us hints of Chris Brown…Jovanie may be but 14 years old but he's already got his approach down pat." The official video for "Whip!" racked up an impressive number of views and was recently awarded a spot in MTV's video rotation. Official videos and streams for all three tracks -- as well as links to socials containing behind-the-scenes exclusives and more -- can be found at jovaniesworld.com. In addition, "WHAT'S THE MOVE PT. II" showcases the new single, "Who Knows," streaming now at http://smarturl.it/StreamWTMPt2. A companion video is currently in production and will premiere soon. Recent weeks have seen Jovanie draw acclaim and attention at such high profile events as New York City's BeautyCon, where his performance was attended by some of today's top YouTube vlog stars and other fashion, beauty, and lifestyle content creators. What's more, Jovanie was featured on MTV News' coverage of the annual event, daring to attempt "The Blindfold Lipstick Challenge." Jovanie is already an online phenomenon with massive followings across the social media spectrum, fast finding a fervent fan following with his presence, natural talent, and remarkable vocal tone. One platform we've seen specifically champion the young artist is Flipagram -- Jovanie has over 77k followers and saw an increase of 54k followers in under two months. The Brooklyn native has been pursuing his musical career for more than half his life, devoting his amazing energy to both school and his extracurricular dreams. He lit the internet on fire with 2013's viral smash, "Heartbreaker," leading to a string of high profile live appearances, spanning VH1's A Night In Paris concert special to performing the National Anthem at NYC's historic Madison Square Garden. What's more, Jovanie has earned acclaim from some of today's biggest stars, including Maybach Music Group/Atlantic recording artist Wale, who featured the young R&B crooner in his smash "The White Shoes" companion video, currently approaching 2 million views at YouTube alone. Jovanie also joined Ne-Yo as special guest on his annual "Giving Tour," prompting the 3x GRAMMY® Award-winning superstar to declare him "an incredible artist on the rise." For more information, please visit officialjovanie.tumblr.com, instagram.com/jovanie, www.youtube.com/user/JovanieVital, twitter.com/jovanie, and www.atlanticrecords.com. "WHAT'S THE MOVE PT. II"